Note: This tutorial is separated into three blog posts because of the number of photographs. This is part 3. 1. 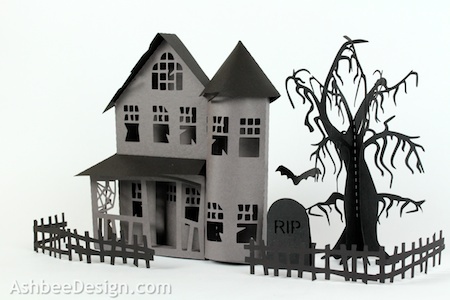 Part 1 and 2: You should have the mansion all assembled from the steps covered in Part 1 and Part 2. 2. Download and cut the files for this project. 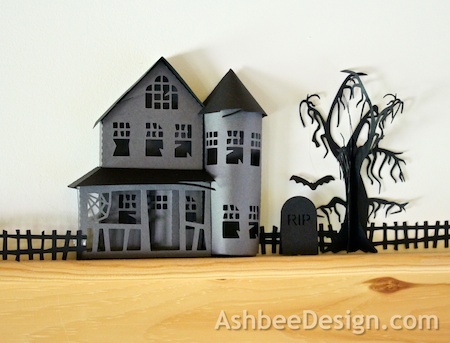 Download the Haunted tree cutting file here. I used a heavier card stock for the tree. 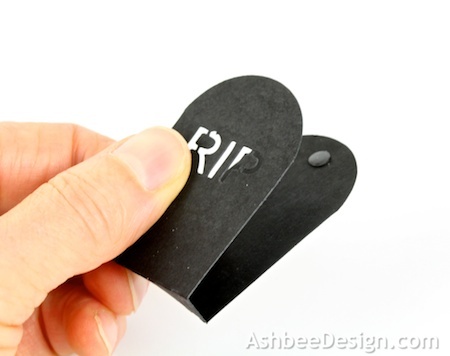 I find the better quality card stock cuts fine lines better. You are to cut three identical trees. Peel them away from the cutting mat with extreme care although it really doesn't impact the design if a branch or two doesn't make it. Here are all the cut parts. There are 3 tree pieces. Two get folded along the dotted line and one stays flat. The 3 trees will be glued together as shown in the following diagram. This is a view looking up from the bottom. 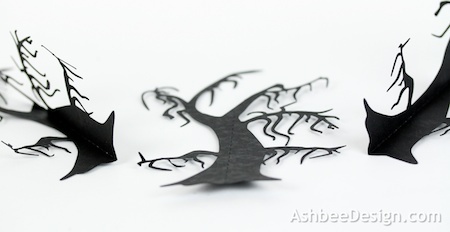 The flat tree with no fold (black) will be on the back. 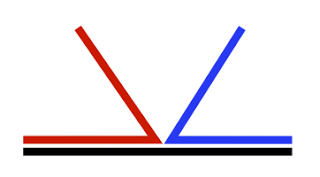 One tree will be folded and glued to the left half (red in diagram) of the flat tree. 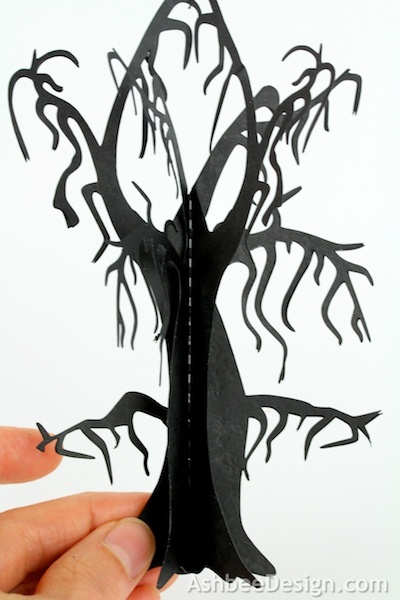 The other tree will be folded and glued to the other half (blue in diagram). 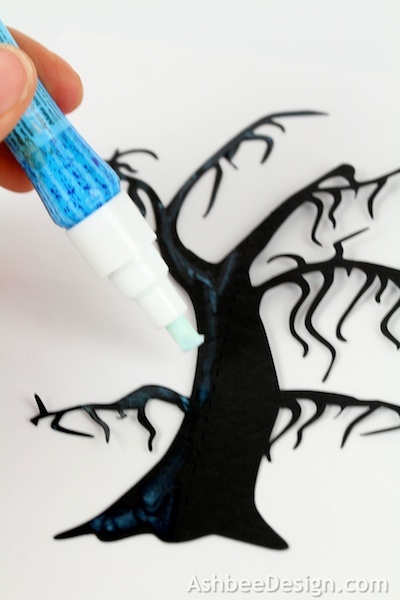 You glue the side that matches the branch shapes on the back piece. Apply glue to one half. Place the folded tree on it. Repeat with the tree on the other half. I chose to cut a few of the lower branches off the front folds of the tree. My goal was to make it look like it had just two "arms". 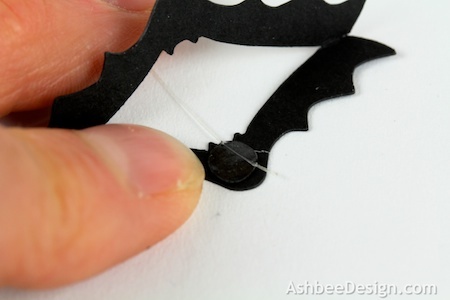 Assemble the bat by putting a glue dot inside the head, add a piece of thread or monofilament to the glue dot and then fold the bat together. The glue dot will hold the thread. 5. Assemble the grave stone. Put a glue dot in the middle top. Fold on the fold lines and glue the two sides together. Put the accessories together with the haunted mansion. Fantastic! I especially like the tree. Thanks Judy, the tree really adds to the eeriness of the display. 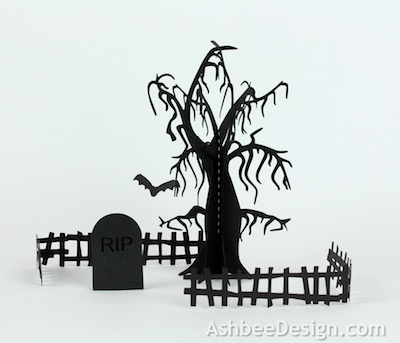 I am anxious to get the files from the Silhouette store! Awesome! My six year old and I had a great time making this. Can you also make a California Mission? Hint, hint! I'll add it to the growing list. I am away from my Silhouette for a couple of months so it will take awhile! Nice job Edit. Thanks for sharing. I have posted her image on my sharing page here.